St. Jude patient Adam of "Adam's Army"
Four of the most heart wrenching and devastating words a parents will ever hear is "Your child has cancer," and it was not too many years ago that a diagnosis of childhood leukemia was one that came without hope, and a survival rate of below 20%. But thanks to the tireless efforts of the researches and doctors at St. Jude Children's Research Hospital, the survival rate for ALL (acute lymphoblastic leukemia) is now over 94%. And nobody is happier about that than 17 year old Adam. Adam was diagnosed with ALL at age 17, underwent treatment at St. Jude, and is currently in remission. But soon after beginning treatment, doctors discovered Adam was allergic to one of the drugs in his chemotherapy regiment. The alternative came at the very steep price of $30,000 per dose, and Adam would need 72 doses. Though his treatment cost would now total over $2 million dollars, St. Jude doctors didn't hesitate, and like all children being treated at St. Jude, Adam's family will never receive a bill for the cost of medical care, treatments, housing, or food. September is Childhood Cancer Awareness Month and Adam has set a goal to raise $100,000 to give back to the place that is giving him both hope and a future. He has created Adam's Army, a collection of run/walk teams across the country, that will be raising money and participating in the annual St. Jude Walk/Run event in late September. "If I can spread hope and give back through events like the walk/run, then I can ensure that other families at St. Jude have the same hope I have." he says. And Rick Shadyac, CEO of ALSAC, the fundraising and awareness organization of St. Jude, agrees. "Our young people today, including patients like Adam, are part of the most philanthropic generation I have ever seen. They have a fundamental drive to help others, and have outlets like social media in which to do so successfully." he said. Shadyac also hopes the Run/Walk and other awareness efforts during childhood cancer awareness month will continue to educate people on how underfunded childhood cancer research is. "Despite statistics that tell us childhood cancer is the leading cause of death among young people, and is the most expensive cancer to treat, research remains underfunded for it." That is where St. Jude comes in. Thanks to its generous supporters, St. Jude spends ten times the amount the federal government does on pediatric cancer research. Though still undergoing treatment, Adam will join his army this month and walk for St. Jude, and then he will start training to run/walk the St. Jude Memphis Half Marathon in December. "I want to give others hope. If I can run for those who can't, if I can inspire others to run for a purpose, then I will." He also plans to one day return to St. Jude as an employee, advocating for pediatric cancer awareness and assisting in the hospital's fundraising efforts. "I can spread hope here." he said. You can join Adam's Army of Run/Walk teams by visiting his St. Jude fundraising page or find one of 58 walks taking place in a community near you. Create a team, start fundraising, join the fight, and let's find a cure for childhood cancer. 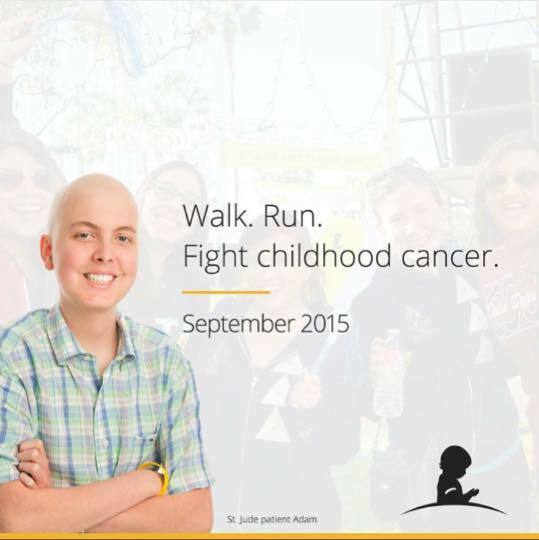 Use the hashtag #showyourgold to show your support for Childhood Cancer Awareness month, and plan to walk/run in September at a St. Jude event near you. Because as St. Jude founder Danny Thomas said, "No child should die in the dawn of life."